When it went on sale in 2002, the S7 was the only street-legal car in the U.S. with more than 500 horsepower and 500 lb-ft of torque. The media and S7 owners have raved about the car and it has been recognized by numerous automotive magazines as the fastest American car in the world. purveyors of supercars. And power figures that looked spectacular at that time might seem quite ordinary a few years down the road. 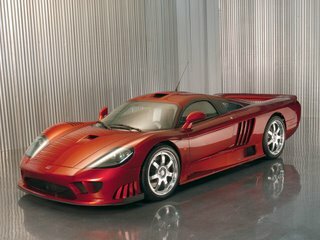 So Saleen engineers have been planning for this day since they drew the first line on a computer screen for the original S7's 7-liter engine. Aerodynamics has also come under scrutiny for 2005. Unless you place the new S7 Twin Turbo next to one of the original 2002 models, you probably won't notice that the 2005 version has a different diffuser/rear spoiler package and reshaped front fenders to enhance the S7s already sleek, swoopy and aerodynamic contours. For the 2005 S7 Twin Turbo, the redesigned front and rear diffusers, along with the new rear spoiler, result in a 40 percent reduction in aero drag and a 60 percent increase in down force. To complement the Twin Turbo's enhanced straight-line performance envelope The S7 chassis has also undergone a fair amount of tweaking. Virtually every suspension pickup point has been changed, and the suspension geometry has been modified for less squat and dive during acceleration and braking. The new all-aluminum V8 engine casting was engineered and tooled by Saleen to displace seven liters. Space age materials and engineering are used throughout, including stainless steel valves, titanium retainers, beryllium exhaust valve seats, an aluminum throttle body, Saleen-designed aluminum CNC-machined cylinder heads and stainless steel exhaust system. 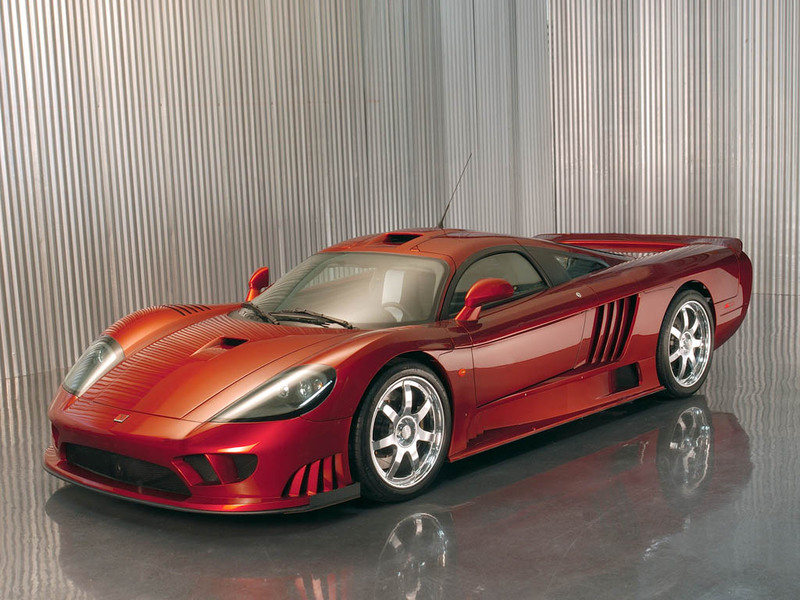 The V8 incorporates a unique Saleen-designed side-mounted water pump, a belt-driven camshaft drive and a Saleen-engineered dry sump oil delivery system. The engine's mid-chassis placement optimizes weight distribution and makes room for an unusually tall engine that allows for a very efficient induction system. Air enters a roof intake, passes through a 90-mm mass air meter and feeds into a carbon fiber plenum. From the plenum the air is routed to the twin ball bearing turbos, is pressurized to 5.5 psi max and then passes through an oval-bore throttle body into an aluminum intake manifold with eight individual runners. catalysts per cylinder bank, EGR and those aforementioned twin wastegates. One of the few internal changes to the twin-turbo engine is a swap from hydraulic to solid lifters. This change allows the engine to rev higher and harder. Also, as is typical with turbocharged engines, the compression ratio has been lowered. It drops from a very high 12.0:1 in the previous naturally aspirated V8 to a still high 11.0:1. And for increased durability, Saleen engineers also added oil squirters to cool the undersides of the pistons. A major improvement in ride is achieved for 2005 with the use of coil springs that are a dual-stage design. The first spring has a lower rate than the single springs fitted to the current S7, resulting in softer ride during normal street driving. But if you remember your history, you know that the S7 is a flat-bottom, downforce car. The faster you go, the more downforce the S7 develops. In the case of the S7Ã¢Â€Â™s new dual-stage springs, the second stiffer spring starts coming into play at around 100 mph when the car begins to develop serious downforce. calipers are fitted front and rear. The brakes are among the largest of any production car with 15-inch vented discs up front and 14-inch vented discs at the rear. performance tire practice, the 2005 S7 Twin Turbo is fitted with taller tires, 275/35R19s up front and 335/30R20s at the rear. While the Michelin Pilot Sport PS2 tires have higher aspect ratios, they also lay tire patches that are 1.5 inches wider at the rear. 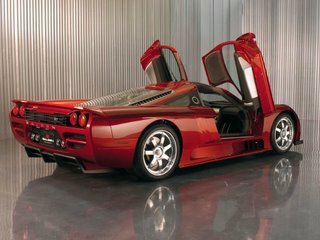 None of the S7's major supercar competitors, such as the Ferrari Enzo, the McLaren F1 and the Maserati MC12, are a match for the S7 Twin Turbo's prodigious horsepower and torque figures: All are at least 100 bhp and more than 200 lb-ft in arrears of the S7. Chalk up another victory for good old American V8 engine ingenuity. It's also no contest when it comes to price. The Manufacturer's Suggested Retail Price (MSRP) for the 2005 S7 Twin Turbo is $555,000. That's $100,000 less than an Enzo (which is out of production and escalating in price) and nearly $300,000 fewer dollars than the Maserati. And you could have Her and His S7s for the price of the McLaren F1!